Ersti-Hütte 2017 - Global Business Management e.V. As every semester, we have been quite keen on staying a weekend at the “Ersti-Hütte”, right before the winter term started. It is almost tradition that the weekend starts off with a joint breakfast at the Mensa of the University where the recently arrived freshmen had the first opportunity to get to know their future fellow students. Afterwards, we settled our luggage and drove to a small but picturesque village called Bairawies, where the GBM-students had already spent the “Ersti-Hütte” the past few years. During the weekend, the students enjoyed some presentation with useful input as for the majority of them it was their first semester at university and a whole new chapter of their lives. Questions from “How to organize my timetable” over “How to get records of lectures” were answered and everything else to make sure they enjoyed a good start in their lives as students. However, the weekend was not only devoted to universital affairs. The members of the GBM Association had prepared several games to ease things up a little bit. 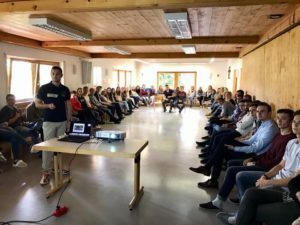 The aim of the “Ersti-Hütte” for the freshmen is not only getting prepared and receiving information about their studies, but also getting to know life as a student, Augsburg as a city and much more. Quite sure everyone’s had a lot of fun and enjoyed a splendid time, having made several new friends.